FOSTER UPDATE: Josh is a happy go lucky active dog that fears nothing. 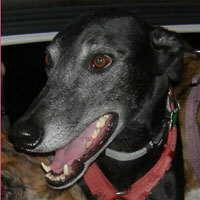 He is living in foster with two other greyhounds. Josh has never soiled or marked the home and has adjusted nicely to being left alone for a while with the other dogs without getting anxious. Josh loves kids and would do well with older children, but he’s a little too active to live with toddlers. While he played ‘nice’ with the daughter’s medium-size beagle mix, he is not compatible with cats or small dogs. Josh is healthy with no food issues. He loves to walk, is good on the leash and rides well in the car. His favorite pastime is playing, either with toys or one of his greyhound roommates. Josh knows his name and the commands: go to bed, No, outside, and come. He would thrive with a family that’s home a lot and have other large dogs.